Ten years represents a pretty decent journey in the brewing industry, a period of time that allows for plenty of ups and downs. As they sit back and reflect on a decade gone, it’s easy to imagine the team behind Rocks Brewing having felt every mile and undulation. The company launched in 2008 as a gypsy brewer, with Harts Pub in The Rocks acting as their spiritual home. To make their beer, foundation brewer Scotty Morgan would traipse across Sydney and beyond, brewing anywhere and everywhere that would accommodate him – in those early days the options were considerably more limited than today. They’d long talked about having their own brewery and that happened in 2014 when Rocks opened a home in Alexandria, a large, modern setup that could cater for large scale production brewing. Things got off to a promising start, but best laid plans oft go astray. Despite picking up trophies and medals – as well as adding a couple more pubs to the wider business group – the brewery and brand just seemed to struggle to get ahead. At the lowest ebb, just last year, the brewery was put up for sale as a going concern yet never ended up changing hands. Instead, they scaled down, consolidated and began rebuilding. Some key people both behind and in front of the scenes chose to leave but new faces came in, bringing new ideas and a fresh enthusiasm. 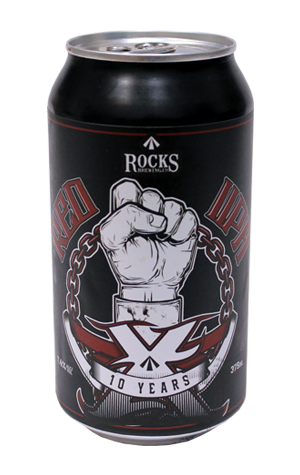 Part of that was the beer and perhaps the most momentous new one to date is this, the Ten Year Red IIPA. As well as an official marker this also represents a metaphorical passing of the baton – not least because current head brewer Jared Stewart had Rocks’ old brewer Scotty serendipitously saunter into the brewery on brew day. The beer itself is a ruby red ale where malt and hops play together, rich malts building up caramel sweetness and a pleasant chewiness while the mostly US hops serve up a punch of citrus and pine accompanied by a touch of spice. In the greater spectrum of big beers this one is very user-friendly, a smooth and relatively approachable 7.4 percent ABV that keeps you coming back for more. With the company now ten years old, that’s what they’ll be hoping you do too. And with plenty more new stuff on the horizon, a striking tweaking of the brand (witness the current crop of label designs for reference) and a plan to can all their beers in-house by the end of the year, the signs suggest decade number two is off to a good start.